If you’re searching for a builder to carry out domestic or commercial refurbishments at your property in Dover, Folkestone, Deal, Canterbury, Margate, Ashford or Kent, our professional team is here to help. We are experienced at renovating homes and offices, from roofing and loft conversions to damp proofing, painting and decorating your interiors. At Bentley Builders, we specialise in block paving driveways and landscaping gardens, in addition to undertaking insurance and restoration work for damaged buildings. Whatever services you may need; our property improvement specialists are the best choice for you! Bentley Builders is a medium-sized, family-run business based in Dover, which has been trading since 1981. Boasting more than 150 years of combined industry experience, we provide first-class installations, loft conversions and repairs in all aspects of the building trade – from painting and decorating to damp proofing and block paving. 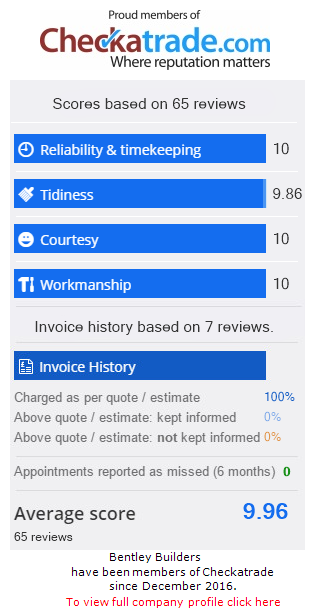 We pride ourselves on being reliable and extremely customer-focused, providing domestic and commercial clients in Folkestone, Deal, Canterbury, Margate, Ashford and the wider areas of Kent with a dedicated service. We can manage your entire project, from the initial concept right through to the perfect finish. Having been established for more than 45 years, there isn’t a problem our tradesmen can’t fix. We supply an expert builder and damp proofing specialist, plus contractors with landscaping, plumbing, electrical, and architectural expertise. We stand by our company motto which is: why move when you can improve? If you need a builder to remodel your domestic or commercial property in Dover, Folkestone, Deal, Canterbury, Ashford or Kent, call 01304 209 299, 07802 644 462 or 07803 642 918.